13 w w w. s p i r i t o f w o m e n . c o m | S U M M E R 2 0 1 7 | S P I R I T O F W O M E N Cooperative decision-making "If you're fighting with your kids, stop," advises Bonnie Maslin, a New York City- based psychologist and author of "Picking Your Battles: Winning Strategies for Raising Well-Behaved Kids" (St. Martin's Griffin, 2004). "You as a parent are in charge, and your wisdom shouldn't be denied, but it's so important to cooperate with your child to get them used to decision-making." In her practice, Maslin works with clients on developing "alliance parenting" skills that help ensure they join with children to solve problems and determine how they can be both independent and safe. "A parent might say, 'So, you would like to go to school by yourself ? Let's come up with a plan to do it and keep you safe,'" says Maslin. "Getting their input helps them feel responsible and is a huge building block to make them successful and independent." 'Structured choices' Another safe way of letting kids learn independence is allowing them to be in charge of "structured choices"— choices about issues like clothing and food that are matters of personal taste rather than decisions that could do them harm. In this way, says Maslin, "you don't get into battles of will. Instead, you allow the child to exert their own thoughtful free will [but] not in a battled way." 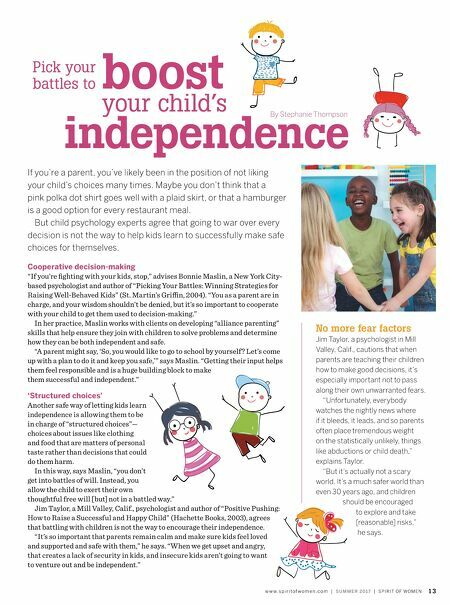 Jim Taylor, a Mill Valley, Calif., psychologist and author of "Positive Pushing: How to Raise a Successful and Happy Child" (Hachette Books, 2003), agrees that battling with children is not the way to encourage their independence. "It's so important that parents remain calm and make sure kids feel loved and supported and safe with them," he says. "When we get upset and angry, that creates a lack of security in kids, and insecure kids aren't going to want to venture out and be independent." No more fear factors Jim Taylor, a psychologist in Mill Valley, Calif., cautions that when parents are teaching their children how to make good decisions, it's especially important not to pass along their own unwarranted fears. "Unfortunately, everybody watches the nightly news where if it bleeds, it leads, and so parents often place tremendous weight on the statistically unlikely, things like abductions or child death," explains Taylor. "But it's actually not a scary world. It's a much safer world than even 30 years ago, and children should be encouraged to explore and take [reasonable] risks," he says. Pick your battles to By Stephanie Thompson independence your child's boost If you're a parent, you've likely been in the position of not liking your child's choices many times. Maybe you don't think that a pink polka dot shirt goes well with a plaid skirt, or that a hamburger is a good option for every restaurant meal. But child psychology experts agree that going to war over every decision is not the way to help kids learn to successfully make safe choices for themselves.